I read this article and found it very interesting, thought it might be something for you. The article is called Red Velvet Cupcakes with Vanilla Buttercream Frosting Recipe and is located at http://eugeniekitchen.com/red-velvet-cupcakes-buttercream-frosting-recipe/. Today I am making red velvet cupcakes! I will add red food coloring in the batter, so we don’t have to add vinegar to balance PH (If you use beetroot for red color, add white vinegar mixed with baking soda to balance PH – it will prevent the chemical reaction between baking soda and alkaline beetroot). And I will make buttercream frosting, which is Waldorf-Astoria hotel style. This is a cupcake with less food coloring. The color of the cake is brighter inside. The red cake has soft delicate texture. And the white buttercream frosting is the Waldorf-Astoria hotel tradition. These are festive red and white cupcakes which are perfect for Christmas, Valentine’s day, and birthdays. 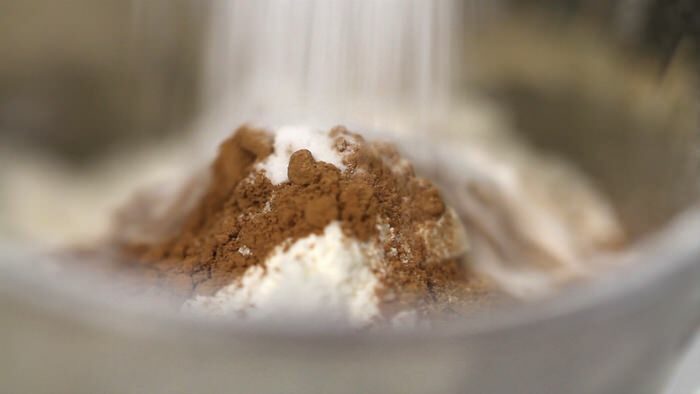 First, in a bowl, add in dry ingredients: flour, cocoa powder, baking powder, and salt. In another bowl, stir in wet ingredients. Sugar, oil, and an egg first. Add in red food color into the wet mixture. 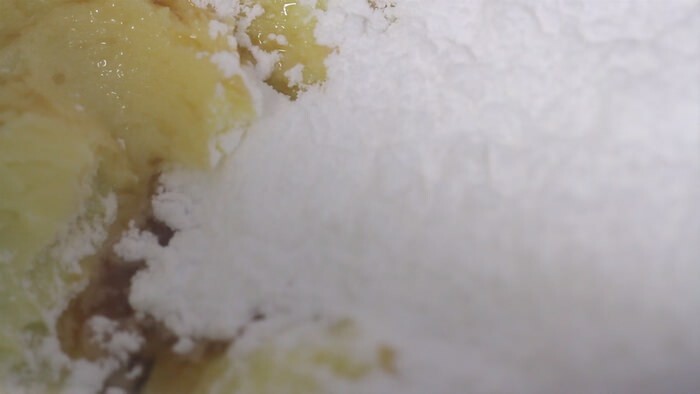 Make a hole in the middle of dry ingredients and pour in the wet mixture. Divide the batter among the cupcake molds. Now bake at 355 degrees F. for about 20 minutes. Adjust the thickness with milk or cream. 1. 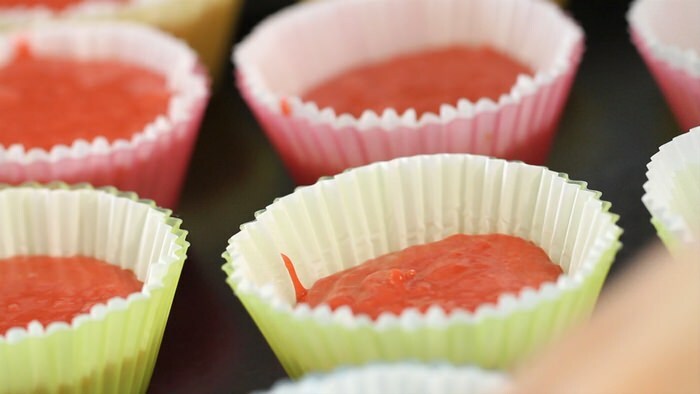 First, line the cupcake pans with paper cases. Individual cupcakes are smaller than muffins. Today I am using silicon cups. 2. In a large bowl, sift flour, cocoa powder, baking soda, and salt. Stir a little and set aside. 3. In a mixing bowl, add in the vegetable oil and caster sugar. 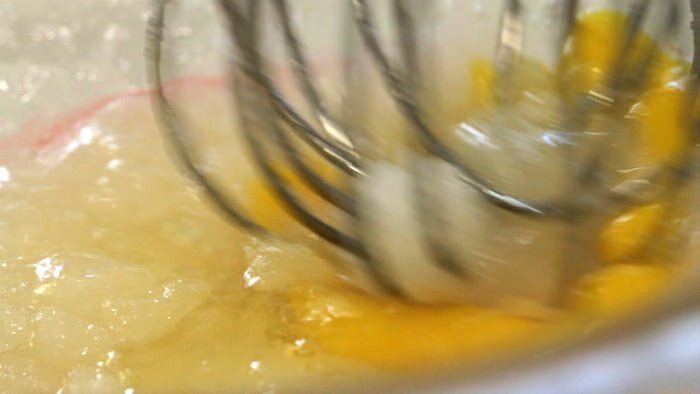 Then whisk until combined. Now add in an egg and beat until incorporated. Then pour in buttermilk. If you don't have buttermilk, with milk and lemon juice you can make a substitute. And add in vanilla extract and red food coloring. 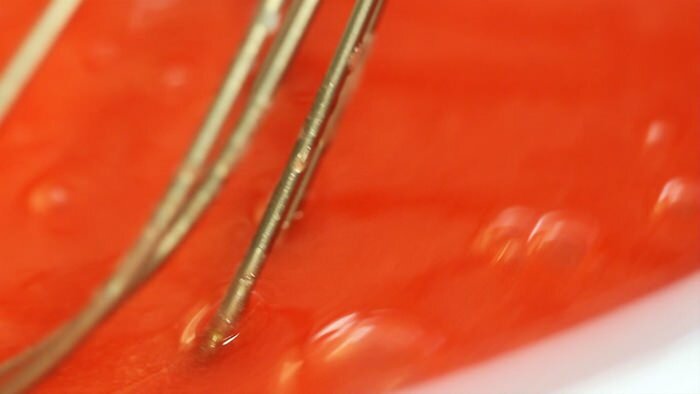 Today I am using gell-based food color. Be careful not to overuse. It is stronger than liquid colors. And whisk until homogenous. 4. Make a well in the dry ingredients and pour in the wet mixture in the center. And with a spatula fold until smooth. 5. Divide the batter among the lined cups. Fill only ⅔ of the cup. Bake at 355 degrees F (180 C) for about 20 minutes or until an insulted wooden stick comes out clean. Out of oven, cool completely in the pan. 6. 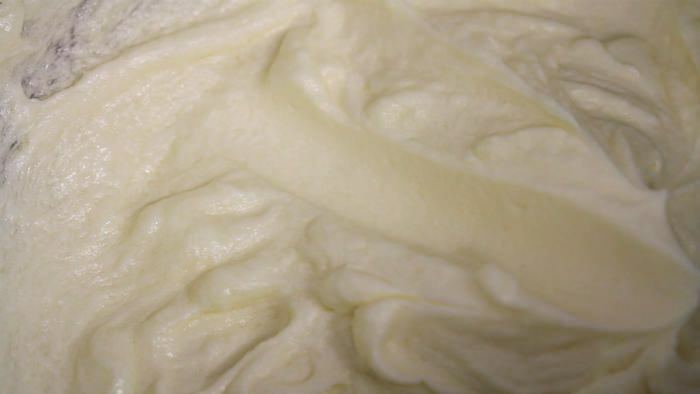 For the buttercream icing, in a mixing bowl add in butter and half of the confectioners’ sugar. On a medium high speed, blend until smooth. Then add in vanilla extract, remaining confectioners’ sugar, and milk and beat until creamy. It should have spreading consistency. 7. With a large star pastry tip, pipe on the top of the cupcakes. Use food color at your discretion. And decorate with your choice of edible sugar sprinkles. 1. Use vegetables oil without strong aroma. Never use extra olive oil for this recipe. 2. If you don't have buttermilk, you can make substitute with 93 ml whole milk and 7 ml lemon juice (or white vinegar). Mix well two ingredients together and let it rest for 5 minutes. 3. If you use less strong liquid based coloring (such as French Vahine colorants alimentaires), add ½ oz (15ml). Dear Eugenie, not only you can bake superbly, you are also very beautiful. 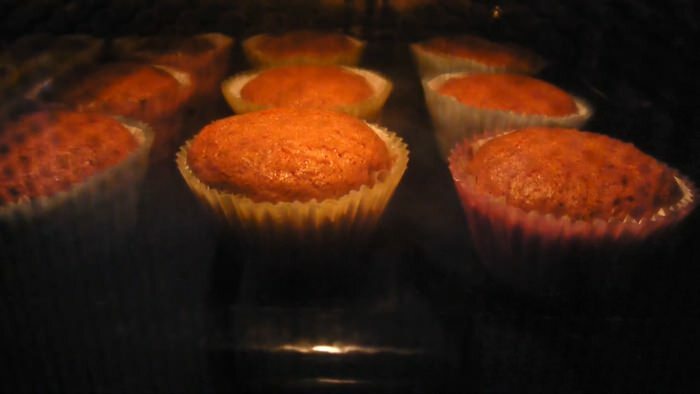 I would like to ask you why do my paper cups turn out oily after baking the cupcakes unlike the ones sold in the bakeries? Dear Irene, thank you for your kind words :) In baking, “emulsion” is very important. 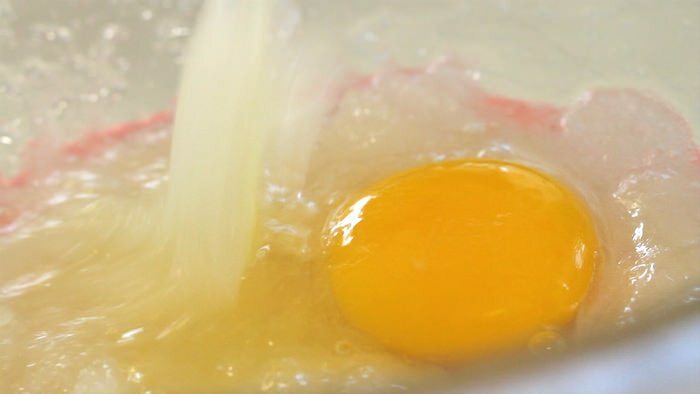 It’s combining oil/fat and water/eggs and it takes time. 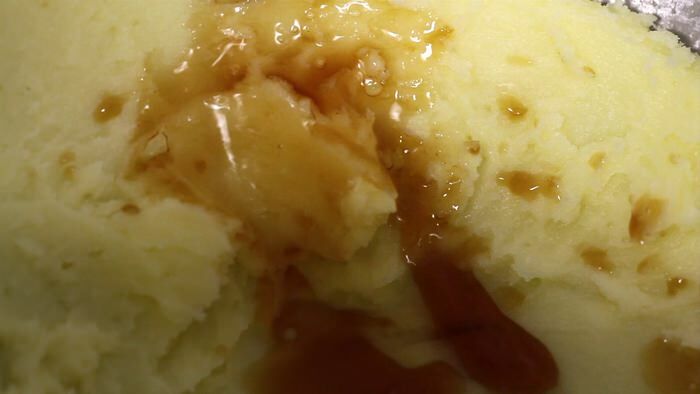 If they are not sufficiently combined, the oil is separated and flows out when being baked. Hopefully this helps! oh, I see, that explains why. thanks for the info. Hi Eugene, if I have extra buttercream frosting left, can it be kept in the fridge and use later? If yes, how long can I keep? Hi, it’s not traditional, you can modify the recipe. With ground peanuts it still works. Hi Ms. Eugenie! I find your website and fb account really interesting! Tnx for the loads of fun and tasty recipes that you kept on uploading for everyone! I’d like to ask something..which is much more tasty to come with Red Velvet cuppies… BUTTERCREAM frosting or the CREAM CHEESE frosting? Looking forward to your positive response! Have a nice day! Hi Eugenie, first I wanted to let you know that I’ve tried several of your recipes and they have been a great success! You will always be the person who taught me how to make a proper rue :) I was wondering where you purchase your specialty items that are generally not found in the local Korean grocery stores like Homeplus (example: buttercream, caster sugar/confectioner sugar, food coloring, etc.) I’ve lived in Korea for over 7 years and still have trouble finding these items. Hi Eugenie!! I live in Seoul and I love watching your videos! Um do you know if korea has buttermilk? What do you usually buy for buttermilk? Thanks Rena! You can make buttermilk substitute which works with certain recipes. Hi, is it summer there? Anyway reduce the amount of milk or add more icing sugar. Happy cooking! Heyyyy, what material is the cupcake liners ? Hi eugenie, i was just wondering what the gas mark is for 180 C?